Stat of the day: £186m. 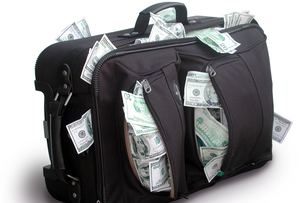 The amount that British air passengers were charged for excess baggage last year. So, before you jet off on your summer holidays, think twice about packing that extra hairdryer/pair of shoes/gold bullion. We've all been there. You're at the airport and you've put your suitcase on the weigh-in belt. Horror! The numbers just keep going up. That'll be £30 for excess baggage, please. And we Britons never learn. This summer, around 27% of holidaymakers will exceed the baggage weight limits set by their carriers, paying out around £1m a day during the peak season. And we're not just talking a few extra pairs or socks here. According to price comparison site Kelkoo, which compiled the data, we're over-packing by 3.5 kilos on average. That's nearly eight bags of sugar over the limit, or one Lego Star Destroyer, or the weight of the largest mango ever found (you can see the beast of a fruit, which broke records in 2009, here). Of all those who paid excess baggage charges in 2011, 37% were travelling on low-cost airlines and 20% on charter flights. But the so called 'low-cost' airlines also charge the highest fines, averaging at £13.20, compared to £7.15 on a charter flight and £7.46 on a scheduled airline. Of the £186m charged in fees last year, the no-frills carriers pocketed 47%.